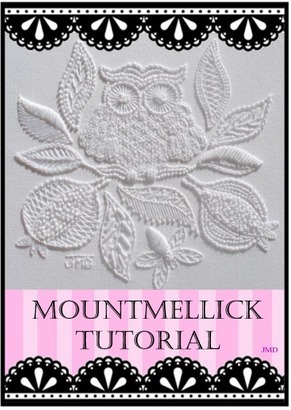 The Mountmellick embroidery style is named after the town Mountmellick in Ireland. The style was first developed around 1835. The town was already known for its linen and cotton milling. The local women found an income for producing this style of embroidery into bedroom adornment and household items etc. 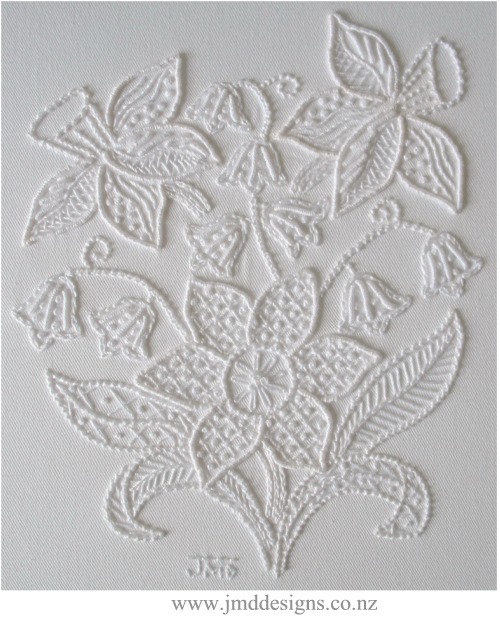 The look of the traditional designs depict the flora of Ireland. Passion Flowers, Shamrock, Dog Rose, Fuchsia, Hops, Blackberry, Vine with Grapes, Butterflies, Sea Shells, Pomegranate, Acorns, Ferns and many more. What ever the ladies would have seen outside their back door and countryside. Butterflies and critters were introduced into Mountmellick embroidery when the English publications started designing and printing Mountmellick designs. For stitching, cotton "satin jean" fabric was traditionally used with cotton thread. The thread was plied together and achieved a raised effect compared with the fine Ayrshire embroidery produced in Ireland at the time. 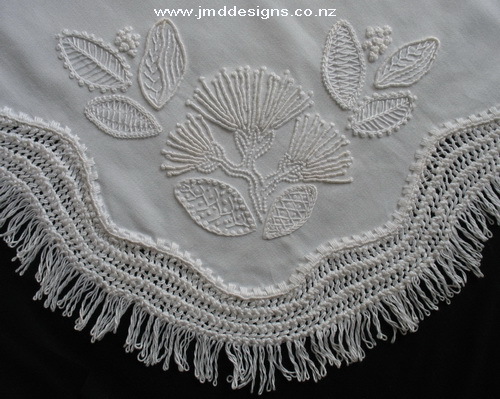 White fabric and white thread was always used. 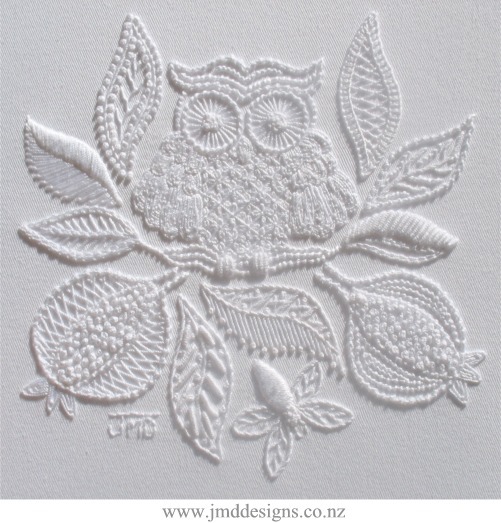 Embroidery stitches used are a mixture of many traditional stitches: Stem, Buttonhole, Satin, French knots, Bullion, Chain, Feather, Coral Knot, just to name but a few. The edges of the design fabric were finished off with either a cut Buttonhole stitching or a traditional knitted fringe, or a combination of both. Today traditional designs and contemporary materials are mixed together. I find a heavy Linen or Cotton fabric more easy to find than satin jean. Pearl Cotton and Cotton-a Broder threads are generally used to stitch with. My favourite is the #10 crochet cotton, as it does not fluff as much as the Pearl Cotton thread. Traditional Mountmellick thread can still be hunted out and purchased. Colours are played with these days, but I suggest only one colour per design (e.g. pink fabric - pink thread) combination is used at a time, or the traditional look can be lost. A true sampler of stitch compositions. The two Pomegranates and the Bee keep the Owl company in his roost. Traditional and contemporary fabrics have been suggested in the book. This design could be framed as a picture or placed on the front of a bag, photo album cover etc. Three variations to this design are also given in the book using the Bees and Pomegranates as small clusters or borders etc. 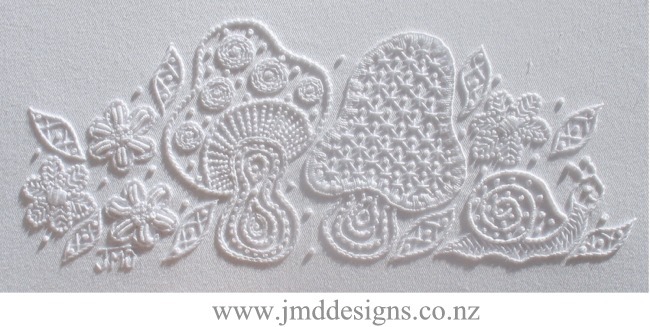 This design pictured is 18 x 17cm (7 x 6 1/2 inches). click here to purchase this individual design. Blackberries with their leaves, Forget-Me-Not flowers and Shamrocks make a stunning traditional Irish design. 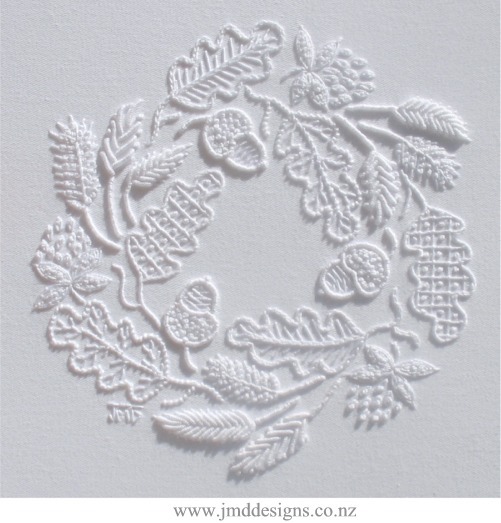 This square wreath could be framed as a picture or placed on the front of a bag or cushion. A table cloth centre with small elements from the main design sprinkled around the cloth edging. Four variations to this design are also given in the book as small clusters and corner sprays etc. Enlarge the designs to suit your own needs. 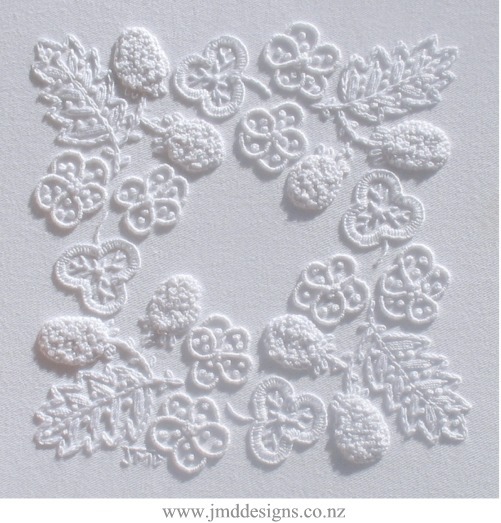 This design pictured is 15 cm (6 inches) square. Spring will truly be in the air with this lovely bouquet of Daffodils and Snowdrops. Traditional and contemporary fabrics have been suggested in the book. This design could be framed as a picture or placed on the front of a bag, photo album cover, cushions etc. Three variations to this design are also given in the book as small clusters, corner sprays etc. This design pictured is 18 x 20cm (7 x 8 inches). Can You See The Fairies? 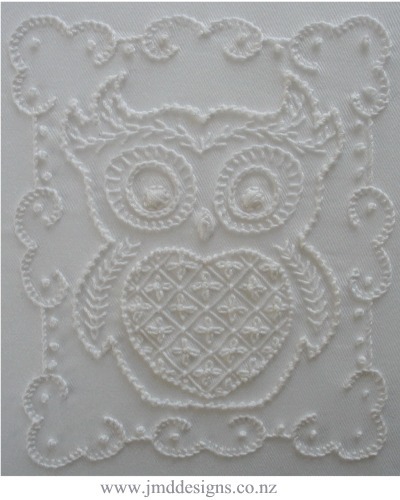 This was stitched in the Mountmellick style using traditional stitches. 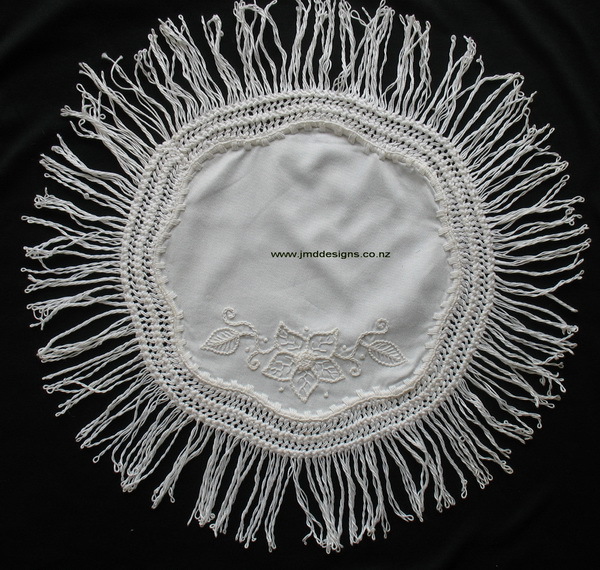 Around the edges are the traditional buttonhole stitching and knitted fringe. The mat above shows the buttonhole wavy edge given to a circular mat. For the traditional knitted fringe only 9 stitches were knitted in each row of the fringe.